Prominent & Leading Manufacturer from Ludhiana, we offer injection machines. Keeping in the mind various requirements of our clients, we are offering premium quality Injection Unit. We offer this range in varied specifications to cope up with the distinguished requirements of our clients from all over the region. 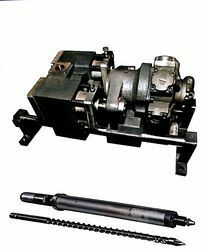 These products are also provided with manually operated electro-hydraulic control that facilitates additional movement to access the nozzle & mould. These products are available in market at competitive rates.